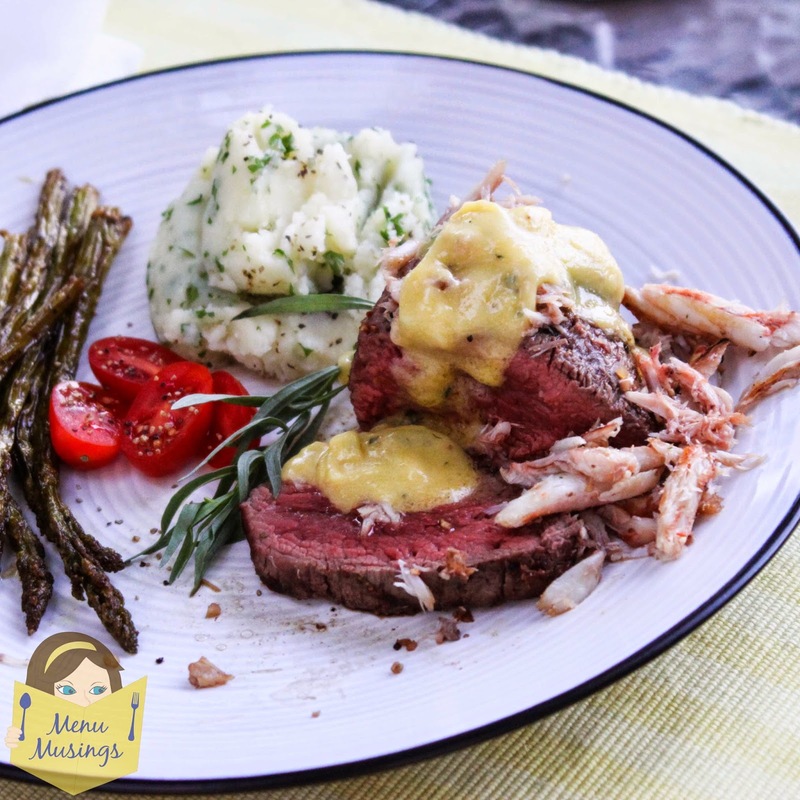 Béarnaise sauce is a sauce made of clarified butter emulsified in egg yolks, white wine vinegar and flavored with tarragon. 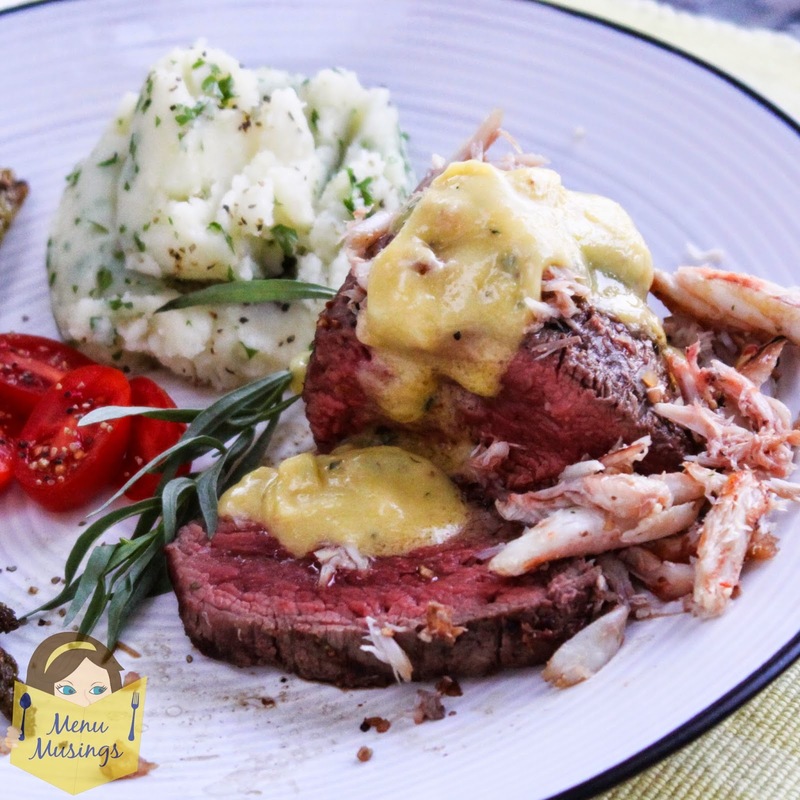 It is considered to be a 'child' of the mother Hollandaise sauce, one of the five sauces in the French haute cuisine mother sauce repertoire. 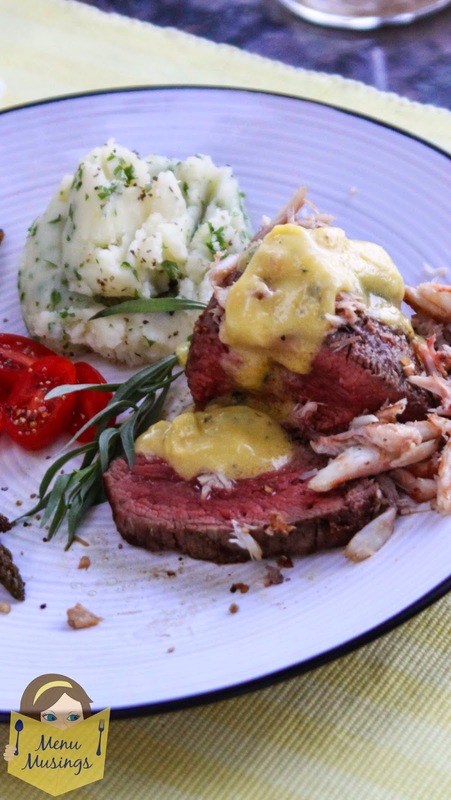 The difference is only in their flavoring: Béarnaise uses tarragon, while Hollandaise uses lemon juice or white wine. Its name is related to the province of Béarn, France. In appearance, it is light yellow and opaque, smooth and creamy. 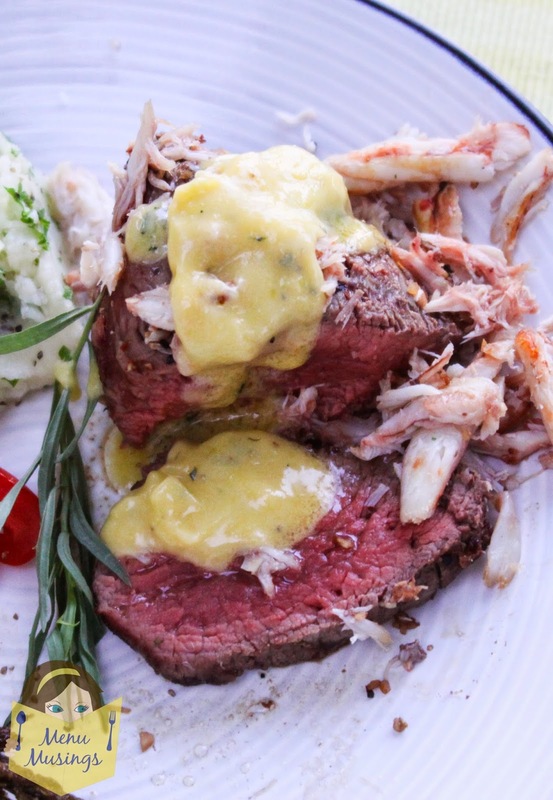 Béarnaise is a traditional sauce for steak. This is one of my FAVORITE sauces! 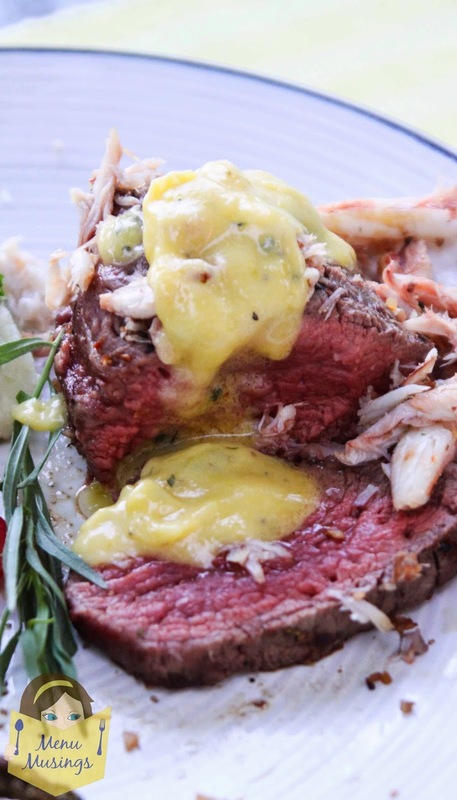 Béarnaise sauce is just divine on top of a grilled filet Mignon with a little scattered pile of lump crab meat! 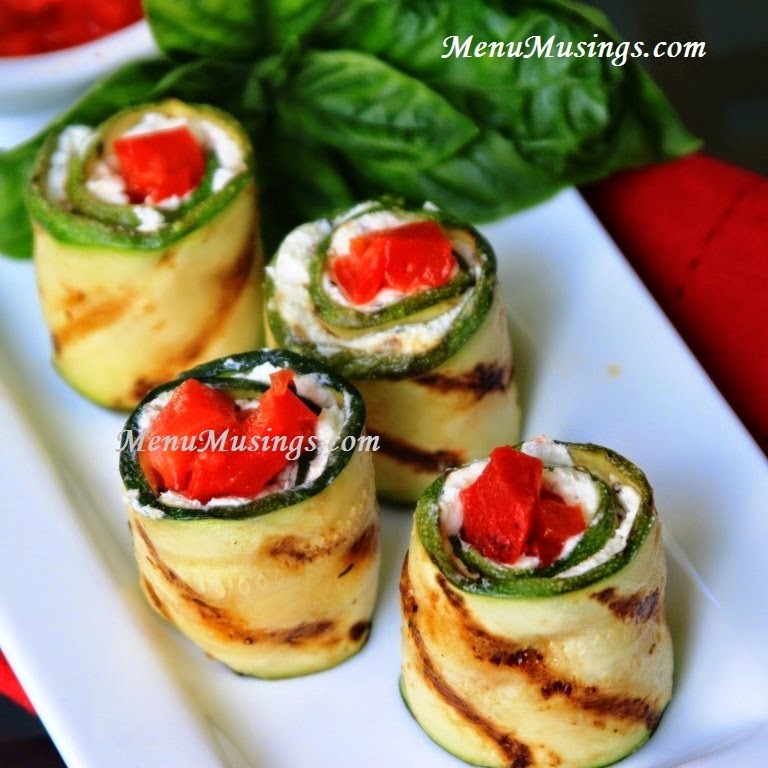 It would also be very nice on a piece of grilled tuna... or over Eggs Benedict instead of a Hollandaise sauce. In a small saucepan combine vinegar, wine, shallots, and dried tarragon and simmer over moderate heat until reduced to about 2 tablespoons of liquid. 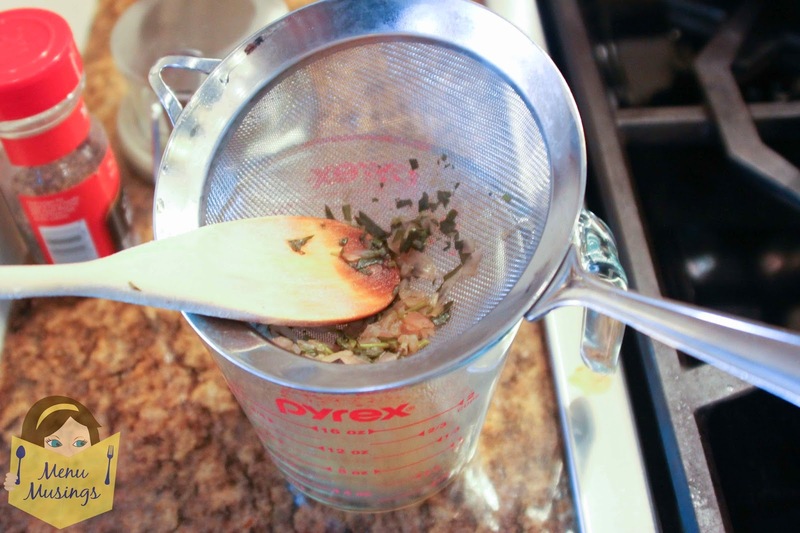 Cool and strain the solids through a fine sieve. 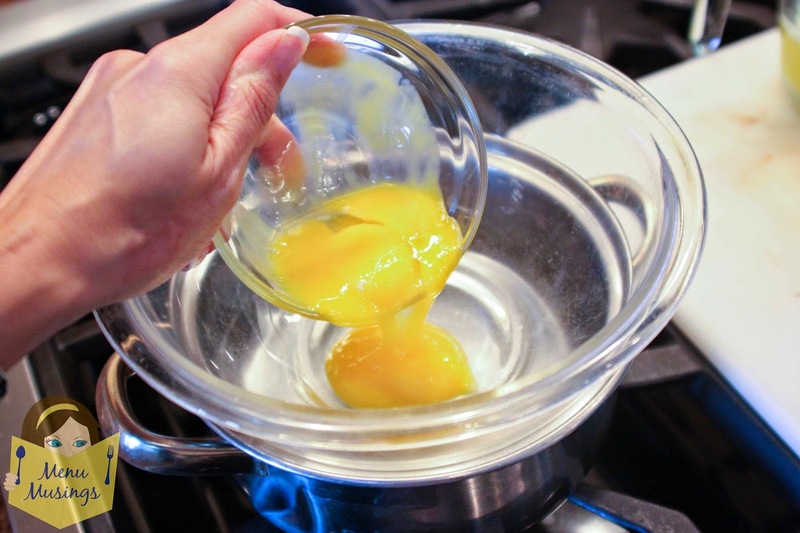 In the top of double boiler or a heat-proof bowl, whisk the egg yolks until they become thick and sticky. You will notice that they turn much lighter in color. 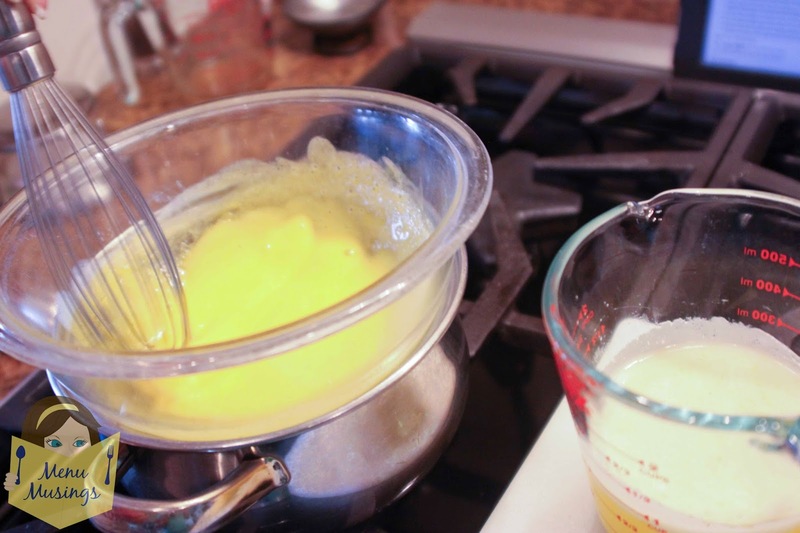 Whisk, whisk, whisk until yolk has thickened. This may take several minutes. 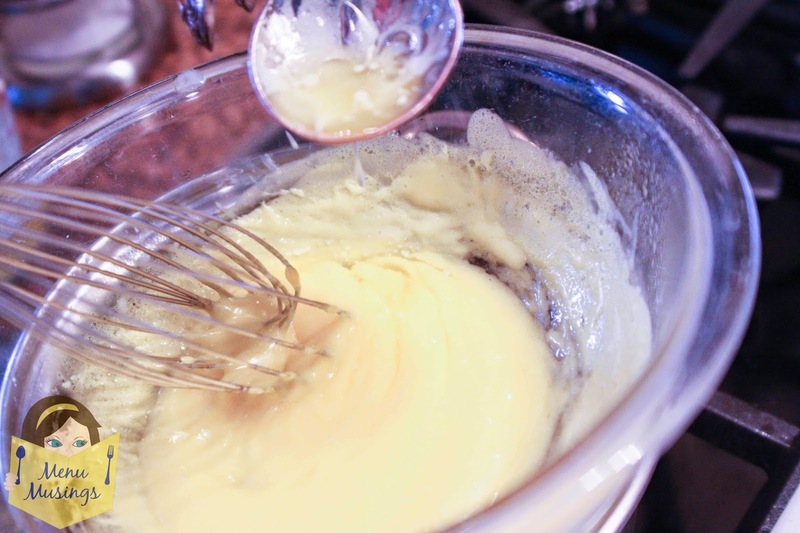 The yolk mixture has thickened enough when you can see the bottom of the pan between strokes and mixture forms a light cream on the wires of the whip. Place the bowl over a saucepan of barely simmering water. 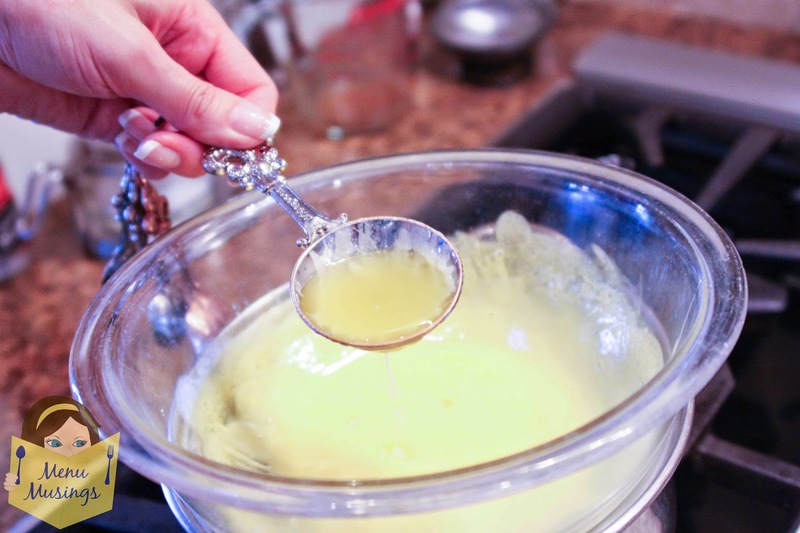 While whisking the yolk mixture, gradually pour in the melted butter, a tablespoon or so at a time whisking thoroughly to incorporate before adding more butter. 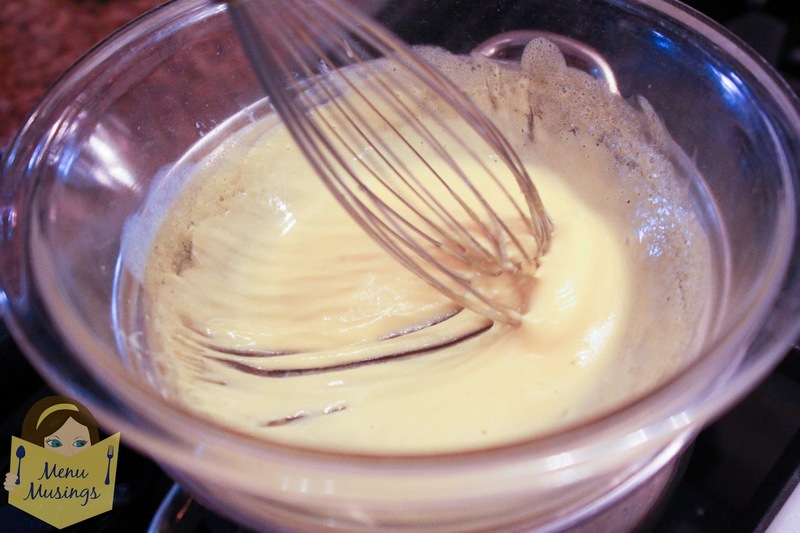 As the mixture begins to thicken and become creamy, the butter can be added more rapidly. 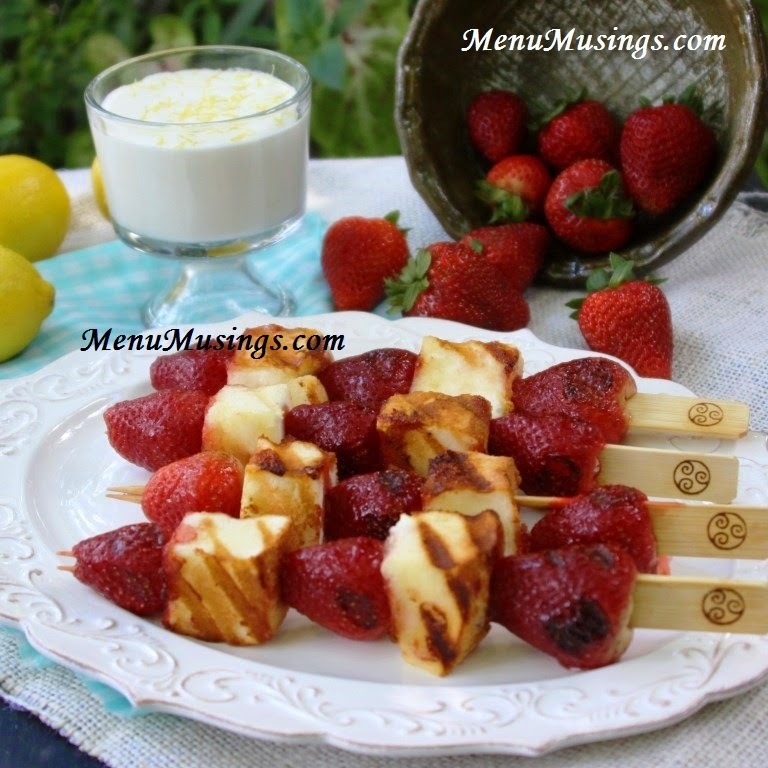 Do not add the milk solids at the bottom of the melted butter (we only want the clarified butter at the top). **Be careful about adding the butter too quickly. Remember, if your sauce "breaks," you have your ice bath to rely on. I always have my big ice bath ready just in case. Yes, I've had to use it when my sauce has gotten too hot. Yes, I freak out when my sauce "breaks." Yes, it does come back together when it cools down. 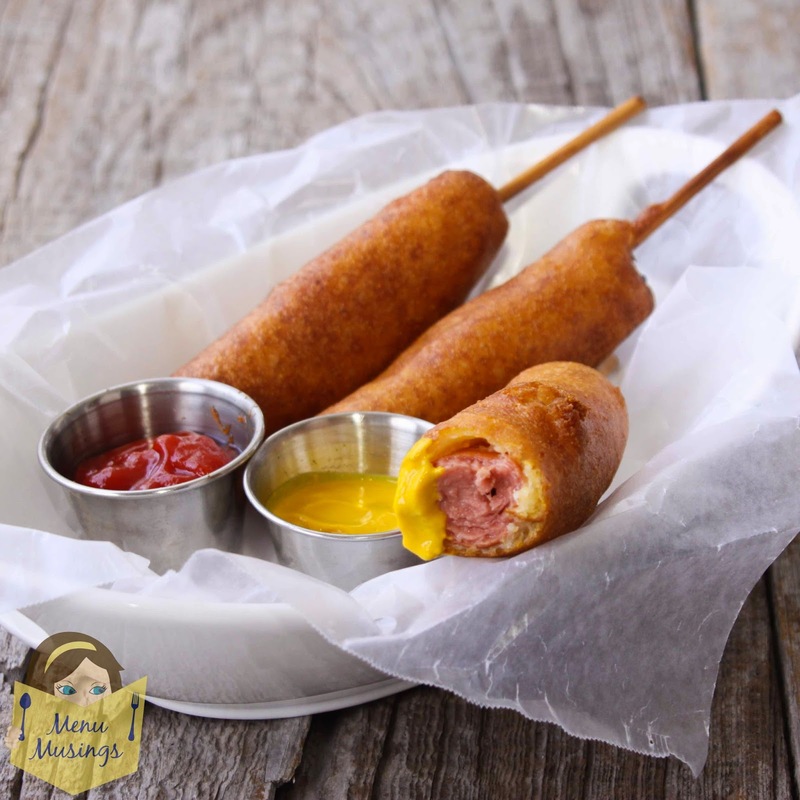 It can be an emotional roller coaster, but in the end, oh my Lord - it's delicious! Whisk in the reduced vinegar mixture and pepper. Season the sauce to taste with chopped tarragon, salt and pepper. 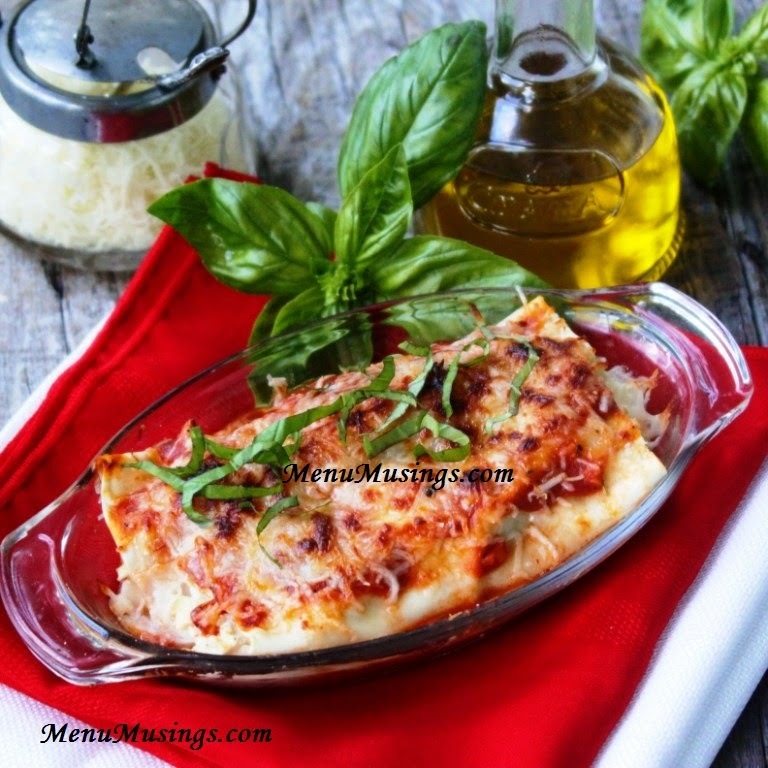 To keep the sauce warm, set the pan or bowl in lukewarm water or in a thermos. One of my very favorite satisfied customers!!! 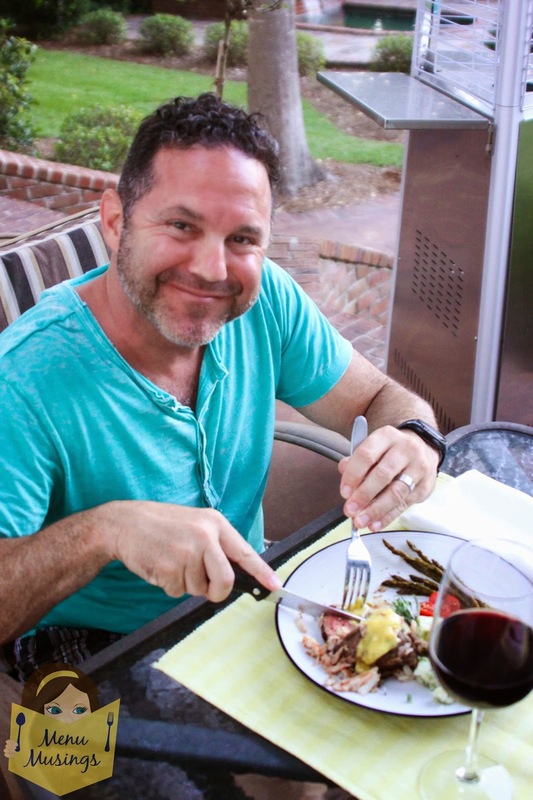 :) You just can't beat eating al fresco, with a little wine, a little jazz music playing, watching the boats and families going by out on the lake in the early evening just as the sun is beginning to set. Here's just one example - Coconut Lime Chicken... Yum!! In a small saucepan combine vinegar, wine, shallots, and dried tarragon and simmer over moderate heat until reduced to about 2 tablespoons of liquid. Cool and strain the solids through a fine sieve. Place the bowl over a saucepan of barely simmering water. 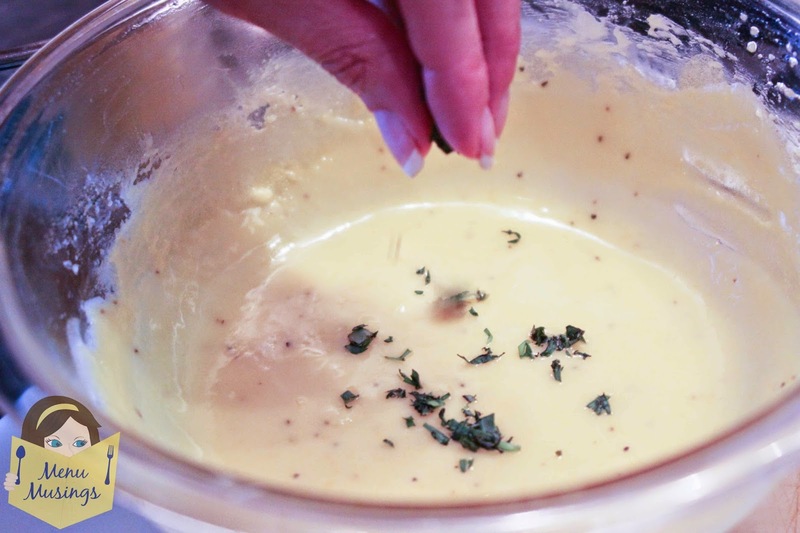 While whisking the yolk mixture, gradually pour in the melted butter, a tablespoon or so at a time whisking thoroughly to incorporate before adding more butter. 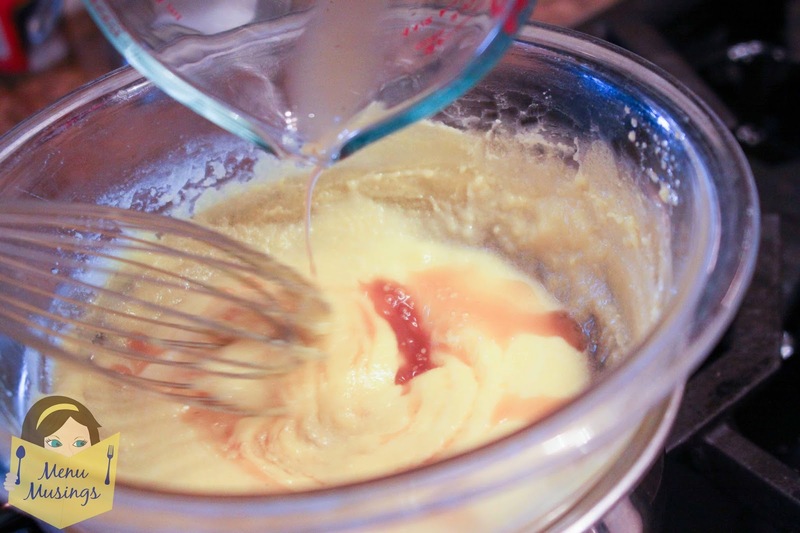 As the mixture begins to thicken and become creamy, the butter can be added more rapidly. 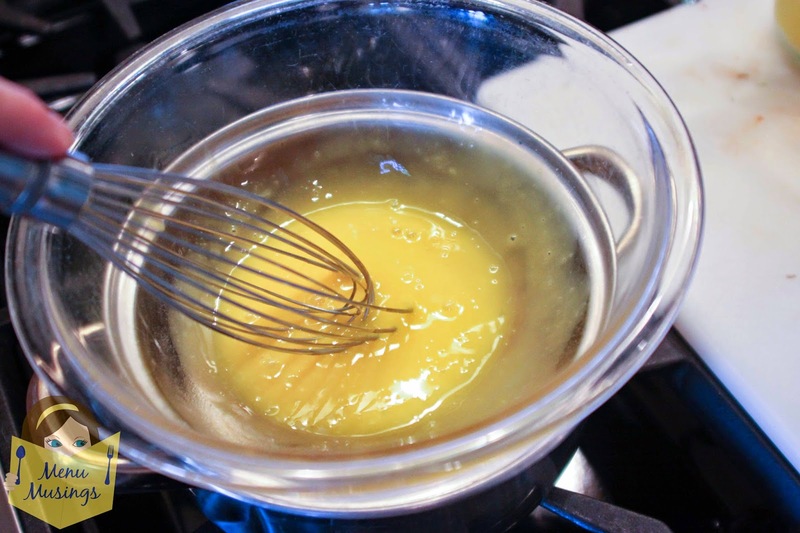 Do not add the milk solids at the bottom of the melted butter (we only want the clarified butter at the top). **Be careful about adding the butter too quickly. Remember, if your sauce "breaks," you have your ice bath to rely on. I always have my big ice bath ready just in case. Yes, I've had to use it when my sauce has gotten too hot. Yes, I freak out when my sauce "breaks." Yes, it does come back together when it cools down. 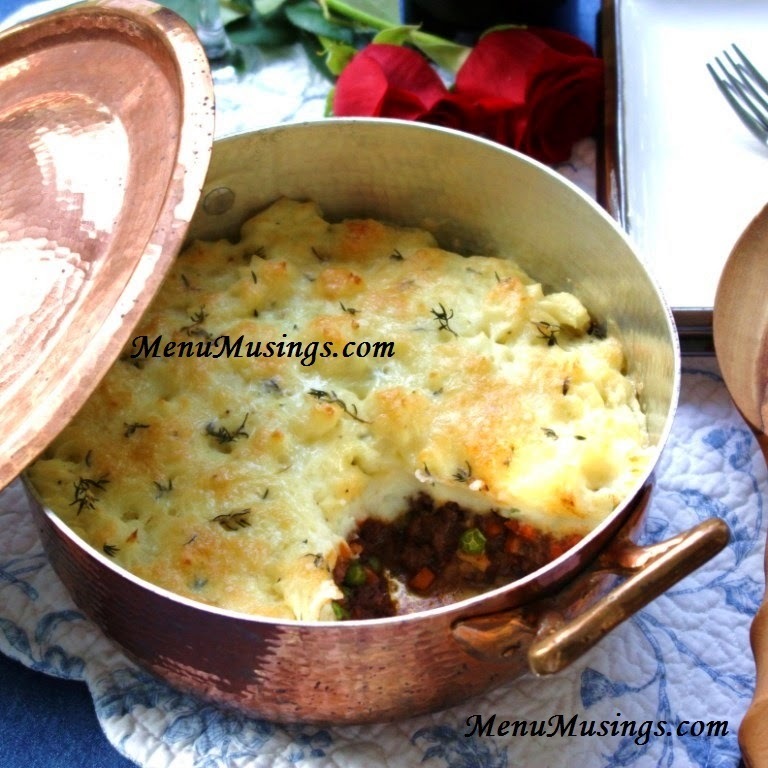 It can be an emotional roller coaster, but in the end, oh my Lord - it's delicious! 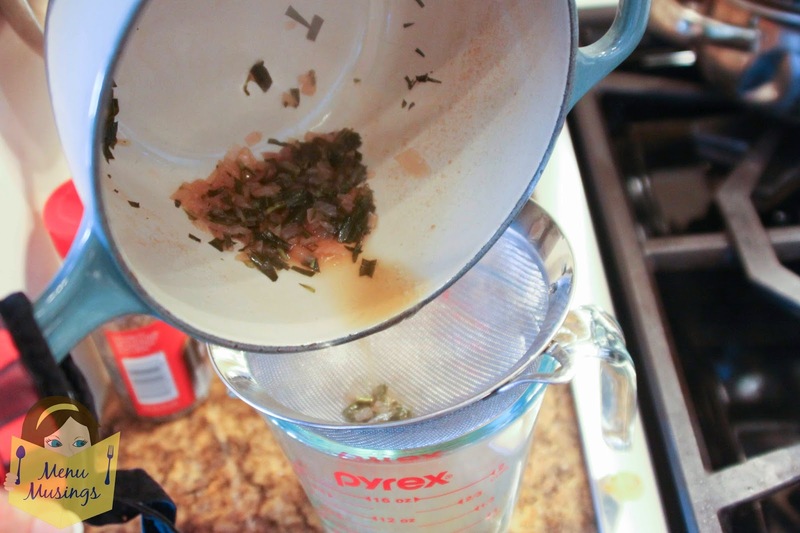 Whisk in the reduced vinegar mixture and pepper. Season the sauce to taste with chopped tarragon, salt and pepper. 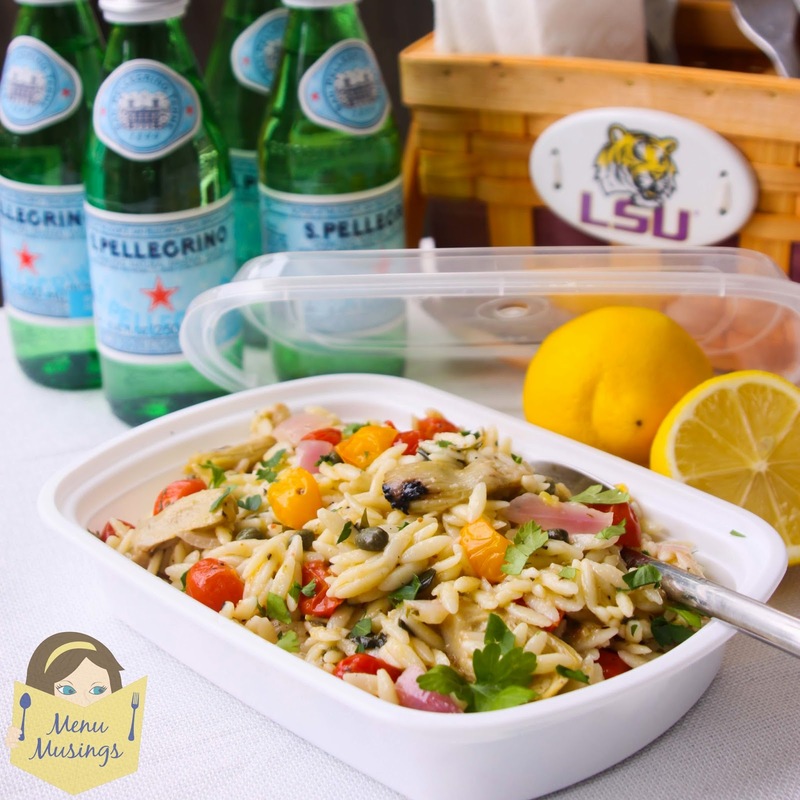 To keep the sauce warm, set the pan or bowl in lukewarm water or in a thermos.